Seeing Max’s life hang in the balance is a jarring feeling - but it’s not about the suspense or drama surrounding that possibility. We are back from the winter hiatus and diving headfirst into the resolution of New Amsterdam’s winter finale cliffhanger. While out with his wife, Max collapsed and the scene went to black. We spent the winter break pondering Max’s fate, and “Six or Seven Minutes” didn’t waste any time at all picking up where the previous episode left off. There is a lot to take away and ponder about “Six or Seven Minutes” particularly when it comes to the character of Max. Ryan Eggold does a phenomenal job portraying a character that is so layered, honest, caring, and complicated. With Max down for most of this episode, there was a lot to think about in regards to the story. At the center of New Amsterdam is Max and how unconventionally he runs the hospital. It’s not how most people or rather anyone would choose to do things but in Max’s case, he’s made it work. That is what brings a lot of soul to the show because it’s a character we just can’t get enough of. He stands for everything right and good in this world, especially when all of us could use it. Seeing Max’s life hang in the balance is a jarring feeling in “Six or Seven Minutes”. Naturally, it wouldn’t make sense to kill him off but it’s not about the suspense or drama surrounding that possibility. Rather, it’s the idea of what the show would lose out on if we lost this character. During the episode, flashbacks were shown of him and his wife Georgia. While things started out seemingly perfect, they grew complicated as Max decided to take on the position at New Amsterdam. It sheds light on the complications of their marriage but it also reminds us how much is at stake for Max. He’s essentially sacrificed so much to take on this job, and he does it so darn well. Such a character reminds us that there is so much more to television shows than drama and suspense. 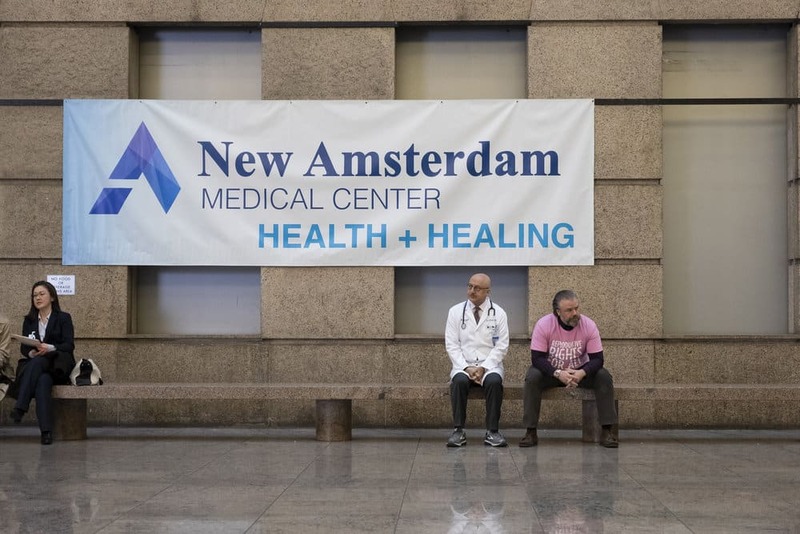 New Amsterdam is a show about people, taking care of people, and the willingness to work together to make things right. That is what Max represents and in this episode, we are threatened with the prospect of losing that. “Six or Seven Minutes” also highlights another important contribution that Max’s character has brought to the story. His attitude and approach to his job have impacted the people around him. We see Iggy and Kapoor realize that because they themselves have changed since Max has arrived. They’re not who they used to be, and it’s forever changed how they operate as doctors. Seeing Max in a helpless state basically impacts everyone close to him, and puts into perspective how much he is valued. This is one of the best things about New Amsterdam. Many shows have memorable characters, inspiring characters that we respect and love. However, it’s seldom that a character such as Max comes along. He’s not in it for the fame, or the attention, or even the status. He just wants to help people, even if it means bending the rules from time to time. Do we even have doctors like this in real life? And if so, where can we find them? The best part of “Six or Seven Minutes” comes at the end when Max comes to and makes the decision to do chemotherapy and stand down from his role. However, his team insists he stay on and that they will take on extra responsibilities to make it work. It is such a poignant and beautiful moment because you see the respect and love they have for him. They are willing to go above and beyond because that’s what he does. It’s so charming and humbling to see this take place in a drama series – namely medical drama series. Quite often, medical dramas spend way too much time on the secret hookups or the dramatic patient. But New Amsterdam does something completely different, and it is why so many are drawn to this show. We care what happens and we are invested, and it all comes down to the fantastic Ryan Eggold and how he plays Max. There are a lot of emotions to process in a show like this and with Max at the center of it all, it just amplifies all the feels. Seeing Max struggle with his health over the course of the season has been hard. But seeing as how everyone officially knows he’s sick, it is starting to change the tone of New Amsterdam. From here on out, there will be no secrets regarding Max’s health and with everyone working together, the collaboration will bring forth a positive and optimistic feel to the show. In the coming weeks, it will be interesting to see where they take the story. Hopefully, it continues to be impactful and focuses on all the good Max represents. We could do without the focus on his wife who seems to be the only con of the series. Her relationship with Max and her inability to support him (at least in the flashbacks) has been quite upsetting. In fact, it adds to the value we already attribute to Max. Despite all the reasons he shouldn’t have gone to New Amsterdam, he still does. And if his wife doesn’t see the difference he has made working at the hospital, then we have no idea what to say. Max’s character is the perfect example of how every character should be represented. And this episode is proof of that. The impact he’s made on the characters in the show translates to the viewers who have found a connection to him as well. “Six or Seven Minutes” helps us understand what is at stake, and what it would be like if Max wasn’t a part of the story anymore, and it also sheds light on how the rest of the season will look moving forward. We look forward to the rest of the season and commend New Amsterdam for giving us one of the most inspiring characters on television right now.